My trip to Munro’s for this edition’s bar review has given me a taste for artisan Scottish gin. As we looked over the drinks list in the pub, I noticed that they had more than a dozen gins from all over Scotland. As the gin thing seems to be taking off, I decided to try one from Aviemore. Gin, it turns out, has come a long way since I was an undergrad buying cheap and nasty gin to mix with whatever we had to hand. This one was excellent. For other liquor enthusiasts, Munro’s has a fair selection of Scottish single malts, blends, and bourbons, a wide range of rums, and plenty of liqueurs and shots. And the beer selection is excellent as well, a range of European beers like Weithenstephan, Birra Moretti, Staropromen, and Lagunitas, to Scottish beers such as Schiehallion, Tennent’s, St Mungo’s, and two guest cask ales, which were Kelburn Dark Moor, from Glasgow, and Coorie Doon, from the Late Night Hype brewery in Clydebank. As I’d never come across the Clydebank brewery before, I tried that one. I’m always a fan of pubs who sell beer from small, local microbreweries. 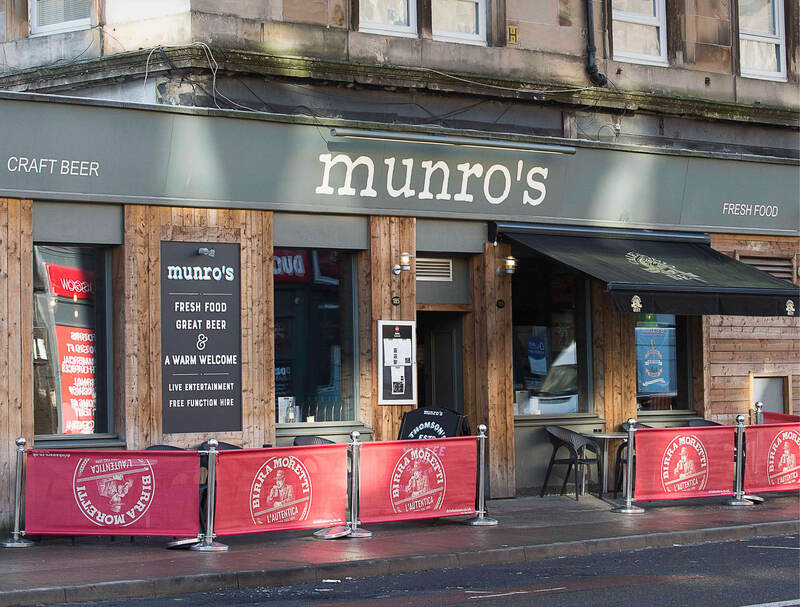 Munro’s is a welcoming pub, with lovely wooden signage and huge windows looking out onto Great Western Road, letting in natural light and patrons can watch people and traffic on the busy road outside. Inside, it feels warm and cozy in spite of being a large, relatively spacious bar. The interior is divided into several rooms, some with re-upholstered sofas and booths, exposed brickwork for a rustic feel, and in the middle, near the bar, sits a table made out of a giant recycled cable drum. Other evidence of ‘upcycling’ includes rugs hanging on the walls, alongside other items from junk shops. It’s also dog friendly. The pub, formerly the Captain’s Rest, takes its name from Munro’s Motors, a car dealer occupying that corner of Great Western Road in the 1960s. But it also has allusions to the munros, Scotland’s mountains over 3000ft, with photos of the mountains in the pub and portraits of Hugh Munro, the first British mountaineer who claimed he climbed all of them. For a quiet pint or a G&T or a meal (they also serve excellent food), Munro’s is an ideal pub. It’s located at 185 Great Western Road and opens from 11am to 12am seven days per week.